Shannon J. Miles, left, if accused of fatally shooting Dep. Darren Goforth in August. HOUSTON -- Texas prosecutors on Saturday charged a 30-year-old man with capital murder in the killing of a uniformed sheriff's deputy who was gunned down from behind while filling his patrol car with gas in what officials described as a "senseless and cowardly act." The arrest of Shannon J. 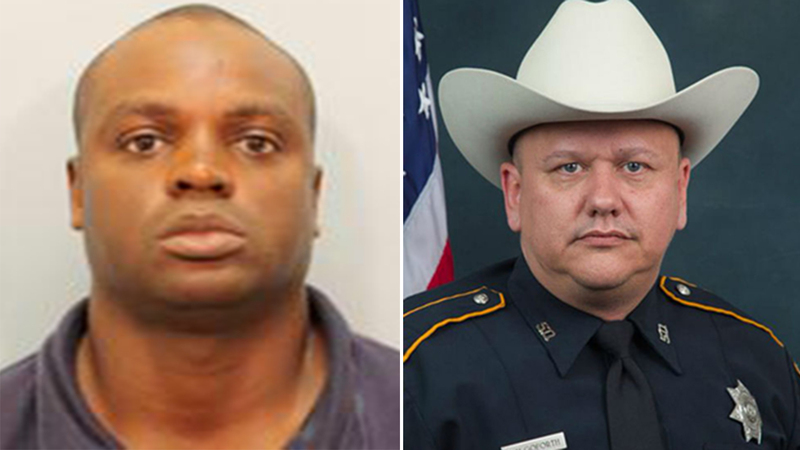 Miles - who has a criminal history that includes convictions for resisting arrest and disorderly conduct with a firearm - came less than 24 hours after authorities said he ambushed Darren Goforth, a 10-year veteran of the Harris County Sheriff's Office, at a suburban Houston Chevron station. Deray McKesson, a leader of the Black Lives Matter movement, responded to Hickman's criticisms, telling the Houston Chronicle: "It is unfortunate that Sheriff Hickman has chosen to politicize this tragedy and to attribute the officer's death to a movement that seeks to end violence." An impromptu memorial sprouted at the pump Goforth had used Friday night, with a pile of balloons, flowers, candles and notes, including one that said, "Gone but never forgotten R.I.P. Deputy Goforth." The gas station was open Saturday, but that pump was closed. People gathered later on Saturday for a vigil at the gas station to remember Goforth.